David M. Rowley, 85, of Canton, gave laughs (and elicited some rolling eyes) with his dry wit, comfort with his enveloping hugs, and strength from his faith. He grew up in West Roxbury with his sisters Helen, Mary, and brother Frank. A 1951 graduate of Cathedral High School and member of Boston College Class of 1955, David established his own company, which he ran for 40 years. His work combined his mechanical and precise mind, his social nature, and his love for the back roads of New England. Along the journey he found his true partner in Geraldine (Gerry) Collins. Married for nearly 55 years, David and Gerry raised five daughters: Ann D'Aquila (John) of York, Maine; Maura Rowley-Himelrick (Paul) of Canton; Colleen Tsao (Paul) of Great Neck, NY; Kathleen (Katie) Colin (Sean) of Canton; and Meghan Little (Robert) of Canton. 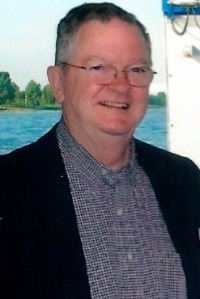 As "Papa" to his 12 grandchildren, Erin, Christopher, Connor D'Aquila; Emily and Ronan Himelrick; Andrew and Ian Tsao; Brendan and Siobhan Colin; and Declan, Maeve, and Brigid Little, David was the ultimate role model, teaching them to be a gracious host, a loyal friend, and a devoted spouse and parent. A short summary of David's life captures only a fraction of his talents as a woodworker, a storyteller, and a barbershop singer; his high standards, integrity, and no-nonsense approach; his decades-long commitment to volunteerism with the Knights of Columbus in both Canton and Cape Cod; and his deep love for his family, who will miss his presence but carry his love, lessons, and memories forever. Visiting hours in the Pushard Family Funeral Home, 210 Sherman St., Canton, Sunday, March 10th from 2 - 6 p.m. Relatives and friends are respectfully invited to attend. A Mass of Christian burial will be celebrated Monday, March 11th at 10 a.m. at St. Gerard Majella Church, Canton. Internment at St. Joseph Cemetery, West Roxbury. In lieu of flowers, please consider a donation in David's name to the Lewy Body Dementia Association: www.lbda.org; Lewy Body Dementia Association, 912 Killian Hill Road, S.W., Lilburn, GA 30047; or St. Jude's Research Hospital: stjude.org; 501 St. Jude Place, Memphis, TN 38105.